Following are parent testimonials for kids we’ve worked with over the years. Some of the testimonials are from the parent evaluation at the end of the program, some came in mid-way, whereas others were unsolicited letters or notes. They are in no particular order and are not grouped by program. We’ve done this because, in the past, a parent may have read testimonials for a program and think that was the one, but had he or she scanned through them all, a different program may have emerged as a better fit. Look through the following testimonials with an eye for kids who sound like yours. Our assessment really enables us to help you choose the best fit for your child’s personality and abilities, time availability, budget, and educational/learning goals. For the written online testimonials we have chosen to not include the real names of the kids and have omitted the parents’ names in order to protect the privacy of the children. However, the testimonials are real and can be viewed in our Langley office. You may also want to read the newspaper stories about us and our students. Today he came out of his session (at Accomplished Learning Centre) so happy and motivated! I found him voluntarily writing a couple of sentences the other day, too. This is something he has never done before! He even read a little baby book to his brother the other day out of his own free will! We have just finished our 8th week of Fast ForWord. I started to see subtle differences in my son’s ability to track and participate in conversation after just 4 weeks and it keeps getting better! Seeing the delight on my son’s face when he’s able to partake in conversations is the best part. These brain plasticity interventions have offered the best (and really the only) tangible results for my son’s difficulties. I feel so blessed to have found a provider in the lower mainland. Thank you Lisa and Ross. 3) That he has reading, math and written output disorders (no surprises there) but that he is reading at a grade 3 level. Last year he was not even reading by this time! Lots of hard work on his part and, of course, all your efforts have contributed to this. There is still a long way to go but we are confident that our son will find his way. Note from ALC: Until just recently, this 11 year old boy was diagnosed with Autism. Over the course of the past year he did PACE, Interactive Metronome, Fast ForWord, Samonas, The Listening Program, and synthetic phonics with us. We are very pleased with the progress this young man has made during this time. Hi Lisa – Just wanted to send you a quick email to let you know the good news. My son has been using the Fast ForWord program for about 15 days and after discussion with his teacher, he has increased four reading levels! She also mentioned his focus, comprehension and reading fluency has also improved! I am so excited to see what the next few months will unfold. Thank you. Note from ALC: It is as if the program pokes something awake in the brain. We don’t promise four reading levels in three weeks but it certainly happens often enough. Hi Lisa – I just wanted to share with you my daughter’s progress so far, post PACE. She has a B in Humanities (English and Socials combined). That is a year long course, so she has potential to improve with time. Her biggest challenge seems to be speaking up in class as she is still very shy, and she could use some extra help with her essay writing skills, but so far, I am happy with her progress. She just started math this semester and look at her grades below! (Pythagorean Theorem Quiz 77%; Pythagorean Theorem Test 83%) I’m so thrilled, although she thinks she could have done better. This is the same kid who struggled in math all her life. Thank you for all the great work you did with her this summer. I think it is paying off. I met with my daughter’s teacher recently. While her reading has not yet shown much improvement, her writing has come along incredibly. At the end of term 1, her writing was all squished together and illegible, and with many spelling errors to the point where her teacher nor I could decipher it. The attached picture is something she wrote in the last week. 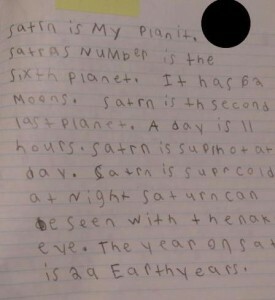 I actually had to ask the teacher if my daughter wrote it. The answer was yes, all by herself. Clearly, even though reading was my main reason for bringing her to Accomplished, she is benefiting in all kinds of areas. Thank you. My son’s confidence as a learner has dramatically improved. Prior to PACE he would give up and get lost in his learning which took a significant toll on his self-esteem. He was failing all of his core subject. PACE has helped him take in and process information differently. He is now excelling in his core subjects with 73% being his lowest grade. As a parent it has been overwhelming to see such a transformation in my child. Ross’ way of coaching him through the program was simply amazing. There aren’t words that can even begin to state the amount of gratitude I have for the PACE Program and Ross for the change in my son has made him a happier person and put him on the path to success. I never thought I would be saying, “Boo, seriously, can you stop reading and turn the light out. It’s way past your bedtime.” – lol – My 8 year old daughter has ASD. I was recommended by a friend that this program really helped her daughter. I am also an EA, am a believer of “you gotta try everything on” when you are dealing with a child that struggles in any aspect of their lives. What I love about this program is that, not only do I get some “mommy time” while she is doing it, she also gets her “brain work” time that she knows she needs to keep her at, and in some cases ABOVE, her grade level. This month we are celebrating 3 weeks on the “Steller Speller” list at school and other kids are trying to copy off of her. Temple Grandin would be proud. When our daughter was about to start grade 6 and was still reading at a grade 3 level, we were ready to try something completely new. We were increasingly worried for her and she was increasingly hard on herself, feeling shameful and discouraged about her reading difficulties. We first read about Fast ForWord in Norman Doidge’s book about neuroplasticity and felt ready to give it a try. Lisa at Accomplished Learning was very helpful and kind in helping us assess our daughter and to set up a Fast ForWord program for her. When your child begins Fast ForWord, it takes a leap of faith because some of the activities don’t look like reading assistance at all but that is part of the beauty of the program – it is a cutting edge program based on the emerging science of neuroplasticity and works to build new brain pathways rather than just teaching kids coping mechanisms. With varying amounts of coaching (on Lisa’s part) and prodding (on our part! ), our daughter advanced through the Fast ForWord programs and levels, averaging about 30 minutes a day for 7 months. At the end of those 7 months, she was reassessed and is now reading above her grade level (in the middle of grade 6, she now reads at a a grade seven level)! To say we are thrilled is an understatement! And our daughter is now able to start to rebuild her image of herself as the capable, intelligent person that she has always been and is starting to see the pleasure of reading for fun! We also have a younger child who has a “gifted” designation and when first assessed by Lisa, was reading 4 grades above her grade level. To support her older sister who was struggling with reading, our younger child agreed (keenly) to also do Fast ForWord. At the end of 30 minutes a day for 3 months, our youngest child advanced in reading an additional 4 grade levels and in grade 4 is now reading at a grade 12 level. I wanted to pass along some feedback regarding my daughter who is currently enrolled in the Fast ForWord program. It’s only been a couple of months since she started the program but a wonderful thing happened that I wanted to share with you. My daughter has never really played with toys independently. She always needed her sister or friends to create the play and she just followed along. For the first time I saw my daughter playing with her toys on her own and seemingly enthralled in the play. It may not seem like much but for her she said she can actually imagine the play in her head which is previously something that eluded her. She says she has an imagination now. My son just did his yearly screening at school and his auditory processing skills are in normal ranges! I credit the Fast ForWord program on helping us get him there! Thanks a bunch! Thank you for the assessment and parent consult. You made everything so clear and easy to understand. We couldn’t make sense of the Pysch-Ed our son’s school provided. It just listed recommendations that were completely unrealistic. You explained it to us and showed us what was involved in the testing that you did so that we could understand. Your consultation helped us to understand our child and what he needs to become a better learner. We look forward to him starting a program with you soon. He had a spelling test last week and there are 15 words all together, but the teacher lets him choose 10 words, so he doesn’t get overwhelmed. Anyways, he studied the 10 words, got 10/10 and he did the other 5 words that he didn’t study and got 4/5. Something is working!!!!! Hello Lisa and Ross. I want to thank you for the fantastic work that you did with my son. The best thing we could have ever done to help him with his attention and focusing problem was coming to your centre. Your course helped him so much that, when we received his report card the other day, we could not believe it! His teacher said that he has improved a lot, and he can now actually stay behind school work during regular school hours in a way he never did before. Of course, this gave him more confidence and improved his self esteem. I have also been very impressed with your very warm and friendly environment, extremely important for a child. My son thanked my husband and I for having him join Accomplished Learning Centre. You guys are a blessing. Thank you again. We found www.accomplished.ca on the internet while searching for ways to help our daughter. It has tons of useful information that showed us clues about the hope we’re looking for to help our child. After much research and watching videos explaining how the brain can be trained at any age, we decided to pay for an assessment and parent consultation. Surely it was worth the month. Lisa did an evaluation of our daughter and clearly explained her strengths and weaknesses. As her parents we already know those but we don’t know exactly what would help her. The thing that made us decide to enrol our child in the PACE program is how Lisa explained each and every issue and at the same time explaining the solutions. We know that the PACE program is what our child needs at this point in her life. We’re glad we discovered Accomplished Learning Centre and worked with Lisa and Ross Pearson who are truly professionals in their field. They helped mold our daughter’s brain to improve her memory, math skills, social skills, behaviour, focus, and especially her hearing and speech difficulties. It’s amazing that now she applies her PACE training on whatever she does in school, home, and church – on her own. She now has more self-esteem and her behaviour issues in school have improved so significantly that the teachers cannot report anything for her to improve on. Her anxiety totally disappeared. She can now control her impulse to talk excessively and to touch things when she should not – time to take her to the museum. With the right program, add to that professional people who really care, it’s amazing what scientific training can do to the brain. Ross and Lisa – you make the impossible possible. I can admit that when I first received your e-mail (prior to diagnosis) about Samonas doing amazing things with autistic children, I didn’t know what to think because it sounded so easy! You always think interventions as being time consuming/hard work, but if that’s what it takes to be it. I thought I should keep an open mind. I knew this was the program my son would take after meeting Lisa – there was so much conviction in the program and I knew she believed in it. After a week or two, Mark would come to me and hug me and want to be held. It meant so much to me because I was robbed of that for years. He started to understand use of language more, not taking things so literal as well as being able to communicate more of his thoughts/feelings without getting so frustrated/upset. He started skipping on the sidewalk on the way to Accomplished Learning Centre, but had never skipped before. His spelling tests went from a fail to 100% every week. All I can say is that somehow, someway, part of my child’s soul was put back inside of him. I consider my son to be most fortunate for having the opportunity to participate in this program (as well as myself). My daughter has been attending ALC for a couple of months now. When she started, she hated school and got tummy aches every morning and night when she thought about going to school. After one month of working on ALC’s Fast ForWord Reading Readiness program, she suddenly said to me, “Mommy, school is fun now!” And so it has remained ever since. Thanks, ALC! Our daughter is an amazing 10 year old girl who has struggled with anxiety and moderate learning disabilities for her entire little life. I, her mother, have been so pleased with her success at Accomplished Learning Centre. She has improved in her learning skills at school as well as improvement with her anxiety. She completed the Samonas program prior to finishing PACE. Her teachers at school have commented and raved at her new found abilities and progress in attention and overall improvements in many academic areas. I strongly recommend Accomplished Learning Centre for anyone whose child is struggling in school and life. When Jan started at ALC she had just received her report card for Grade 2 (almost all 2’s and some 1’s). She was continuing to have difficulties in joining in group activities, was not participating fully in gym, and would completely shut down if singled out (even if positively) or upset in any way. Academically she is very bright but was not showing that to her teachers. Her pediatrician stated she was emotionally immature. The school could not help her without any diagnosis. She was not able to finish work at school on time or else “forgot” to bring home her planner and assigned homework. Midway through the program at ALC, Jan’s Interim Report was showing improvement and the teacher happily said that Jan was participating more, she was not shutting down much and her work was being handed in. Now, at the the end, her report card came back with almost all 3’s. Yesterday, her teacher said Jan was even putting up her hand to answer questions. Amazing changes in 13 weeks from what Jan has experienced since preschool. Yes, there have been changes in our son. He steps up to challenges and is eager to try new things. It doesn’t take as long to complete work. It seems to be about half the time it used to take. There is more confidence now than before that opens a door to new adventurous things. He will pick up a book and read without being asked to. Bravo! That is the beginning of great things. His concentration has improved a great deal and is still changing. When I sit down to work on school books he wants to get a question answered and do the rest himself. Before it used to be endless hours of help. He has a bright future open to him. The sky seems to be the limit. We are really excited about his future. We brought Jeff to ALC because he was failing a few courses in Grade 9 and he didn’t know how to get himself out of the slide. He was B honour roll in Grade 8 but had always had problems with concentration, focus, completing his work without handing it in. We thought it was because he was lazy and just didn’t like school. Through ALC we learned that he had problems taking in what was being said to him in class and carrying it over to getting his work done. He is now much more confident and will actually do his homework and hand it in most of the time. He still struggles with not enjoying the work but I think he is starting to understand that it still must be done. 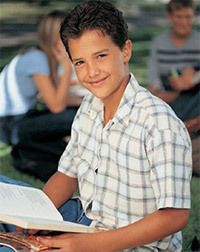 He is also much happier and enjoys going to school for some of the courses and the social aspect as well. Auditory processing – Alex is much more secure with Language Arts and even his speech is clearer. Willing to tackle writing (printing) and more able to control his handwriting. Spelling starting to come along – retaining words, spelling’s better. I would absolutely recommend PACE. Although my son still has difficulties with focusing, he is now eager to work hard without getting frustrated and giving up. The most significant improvement I have noticed is the drastic change in his self-confidence – for this alone was worth every penny and then some! In kindergarten her aggression escalated and over the past 3 years she has become verbally aggressive and physically aggressive towards myself (mom) and her dad. In October her aggressive explosions (mainly at night time) were 5-6 days per week. She was extremely non-compliant and would try to negotiate and manipulate situations endlessly. She would scream and yell and threaten to run away and on one occasion threatened to kill herself by putting a chair underneath her bedroom window and jump out! Her frustration and anxiety levels were constantly heightened despite having a loving, stable and predictable family and home life. Most of her behaviours were kept privately within the home and not displayed publicly, therefore friends and family that spent time with her could no understand (or believe) that she was capable of behaving so irrationally and physically. I had exhausted every avenue I thought possible to provide her with teh best parenting, however I was constantly left feeling defeated and at times inadequate even as an Early Childhood Educator with much knowledge and education. There was also strain being placed on our family unit. The energy she consumed from myself and her dad left very little for her older sibling who at times expressed sadness and frustration at mom and dad for always “dealing” with her sister. The Samonas program has provided my daughter with “hope.” It has strengthened her mind, body, and spirit. It has reconnected us with our daughter. The nighttime bed routine has really improved. The anticipated bedtime explosions are few and far between and can be defused quickly without tears, hitting, and yelling. Samonas is not a miracle… it is a powerful but non-invasive vehicle to help children become the best they can be. Samonas has strengthened my daughter’s inner voice… and she feels heard. Samonas has become a huge part of my daughter’s life! She will continue listening so she can continue to grow and strengthen her new found skills! My daughter (6) has been attending Accomplished Learning Centre for a couple months now. When she started, she was halfway through Grade 1 and didn’t know all the letters of the alphabet yet. After a couple months’ work on ALC’s Fast ForWord Reading Readiness program, she suddenly found it much easier to remember sight words and sound out new words. The other night, she read to me a story which we had been practicing for several days. I said, “Wow, you can really read now!” She countered, “No, it’s just because we’ve been practicing this one.” I told her, “I bet you’re wrong…” and I pulled off the shelf a book which was at the same beginner reading level but which we hadn’t read often or frequently. She made it halfway through before she got stuck! The best part for me was when, having learned the word “scary” in the first book, she read the word “scared” in the second book without hesitation. She’s really getting it! Thanks, ALC. Before Samonas it felt as if every day was a constant battle of wills. She would be extremely difficult if she did not feel like doing something. Now, she seems to understand why she needs to cooperate. Getting up and ready for school this year has been so much easier as compared with the last school year. She is starting to realize outcomes and how her behaviour influences what happens. She still is very strong willed but she can be very cooperative at times. Nina has made significant progress after having completed the program at ALC. At this point, without yet knowing the full results of her post-tests, I would say that the thing we notice the most is her ability to communicate. Before, we were continually asking her to repeat herself or slow down when she was speaking, as it usually sounded garbled or her sentences were incomplete. Now she really speaks very clearly and in paragraphs, not just sentences. Friends and family have also noted her improved speech. Although she still struggles with her reading and writing, she is making steady improvement and is more confident she can do the work. You know if your child’s day is filled with school activities and even the after-school hours are being taken to do, you guessed it, more schoolwork, that something is wrong. If you have taken a year and carefully guarded your time to be devoted to help, and there is not progress. If something like B’s and D’s never got sorted out no matter what easy suggestions you gave him. These were all part of my son’s story. I was getting more stressed out because no results came from very diligent work. So I said to my husband that we must get him tested. Now, he was the seventh of eight children and all were home-schooled up to Grade 7. I had other examples to compare him to. When our supervising teacher recommended Accomplished Learning Centre, I was ready to talk. The first step was an extensive test covering eight areas of the mind. I was relieved to find that the test did validate my suspicions. The troubled areas showed up.. The next step was looking at options. The third step was considering what Accomplished Learning Centre offered. Would this solve the problem? Our son’s options were clear to us. He was going to enter Junior High School in just one year. Grade 7 was before him and it would be the window of opportunity to get things put in order. For the past three years as I worked with him at home I could see that each year was getting harder rather than easier. At this rate finishing his High School with the Dogwood certificate would probably not happen. Why, because he wouldn’t be able to keep up with the yearly workload. He would fall behind. He would probably have to have someone scribe for him. I guess there would always be some learning assistance required. Here is what he said, “Before I was shy and didn’t have a lot of confidence. I avoided the things that seemed hard to do. It took longer to get things done and I always needed assistance. Now, I feel more confident, want to read, and take on challenges without avoiding them. NOTE FROM ALC: He and his mom dropped in a couple of years ago to thank us again. He had graduated Grade 12 with a Dogwood Diploma and was going on to post-secondary education. His self confidence has improved so that he thinks he can achieve things and so he does. Baseball, he is now hitting the ball consistently. Track, he is saying he has lots of endurance and he keeps practising and so he does have more endurance. He carries himself taller as well. For a few years we had a concern that he may be having problems in school. He had been attending learning assistance for four years and we had not seen significant improvements. We read about PACE in the local paper and decided to investigate. At the end of our meeting with Ross and Lisa we decided this program would get down to the bottom of any learning issues he may have. We began to immediately see a difference in his dedication to home learning. He was enthusiastic which made us enthusiastic. He overcame the obstacles. Ross helped him. Our son was always proud when he passed levels. His reading and spelling have improved immensely. He doesn’t have to work as hard at it. We can’t wait to see how the program will help him in the future grades. Thanks! It was very exciting to see our son put so much effort into some of the exercises to get them perfect, without mistakes and to do them in the allotted time. It was also exciting to hear comments from his teacher noticing improvements in the classroom. Since my son started Samonas we have found that his frustration level has greatly decreased. He has calmed and matured. His behaviour has improved in the school setting to the point that he is no longer in need of a IEP. His teacher can’t believe that she is teaching the same child we were discussing at last year’s transition meeting. His vocabulary has increased and he is making more sense when he speaks. His energy level is also better. He had no problems with the Kindergarten to Grade 1 transition, when last year 3 hours of kindergarten exhausted him. His spacial awareness is also much better. My son is a different child. Thank you Samonas, and Ross, and Lisa. We have noticed some great improvements in our son’s overall demeanour since the time he began the PACE program. This improvement has been noted at home and in his behaviour and participation/interactions at school as noted in comments by his school teacher. We are hopeful that this, with other changes, will translate directly and indirectly to his scholastic scores and study habits. She loved PACE. She loved the program, she loved her trainer. We have seen significant improvement in her confidence and self-esteem. Although it is still early since finishing the program, we have seen improvements in a number of areas. Most of all we no longer feel we need to rescue her from homework. Her desire to try and succeed are huge rewards for both her and her parents. We look forward to continued improvement in the next school year! Thanks, Lisa! P.A.C.E. has been a good program for my son. He has gained a little more self-confidence. We have noticed a big change in his memory work. We hope that we can see more improvements in the future. Below is my critique on the work and achievements made by son Ryan while attending PACE in the summer of 2005. When he first started PACE (Processing And Cognitive Enhancement) before the end of the 2005 school year, I was slightly skeptical that this program would work for him. Ryan has been diagnosed with ASD, Autism Spectrum Disorder. Although he is full curriculum in school with teacher’s assistant help for a half-day, I wasn’t too sure that this program would fit his needs and help the areas where he was below age level. It was encouraging that his trainer, Ross, had previously worked with autistic clients even though this would be the first child with ASD working in your centre attending the PACE program. Ryan can be hard to motivate to work when he doesn’t want to, especially for homework. Surprisingly, Ryan enjoyed the sessions with Ross. He liked to come to Accomplished Learning Centre in Langley even if occasionally he did not want to do the work at home. When asked to complete the questionnaire at the end of the 38 weeks, I still was not 100% sure that he had gained as much from PACE (Processing and Cognitive Enhancement) as the more typical children. Well, he did gain and he has shown some major changes since school has resumed in September. I found out his reading skills took a jump just before school ended. He had started the year about 1 1/2 years below his grade and ended the year about 1 year above his grade. This was after 1 1/2 months at PACE. His other problem area was spelling tests. So far, his words in Grade 4 have been harder and he is doing great. Ross was able to help him differentiate between auditory sounds he was mixing up. The last area of accomplishment that stands out is his ability to focus and stay on task longer than he used to. The teacher and teacher’s assistant were both blown away with how much less re-directing of his attention is needed. He has started his intermediate year in Grade 4 by showing an increase in following the class curriculum with less intervention. This was to be one of the biggest challenges the school wanted to address in preparing Ryan for middle and high school where he will probably not be assigned a teacher’s assistant. I hope others continue to seek out PACE and be helped by this program. He has shown a great improvement in his auditory processing along with many other improvements. At school he had problems following directions in gym to many games but now he is right in there and his gym teacher is amazed! In the classroom he is grasping concepts better. He wants to do things “by himself” at school and his anxiety is very rare now. His attention has improved and his printing went from a 2 (barely meeting expectations) in November to a 4 (exceeding expectations) in his March report card – with no extra practicing at home! He is very talkative now and is a joy to be with. He also takes his time with his work as before he would rush through it. His social skills have really emerged now too. There has been a very positive effect with the Samonas program on him. My only regret is not having done this sooner. Thank-you so much Ross and Lisa. The Samonas program helped our daughter in many ways. The most significant change that we and her teacher noticed was her ability to stay on task and be distracted less easily. Her math and reading have improved and are age appropriate now. she no longer needs learning support for her reading. She has a favourite CD that she uses to calm herself she has had a long and tiring day at school. She calls it her “hug” CD. It really calms her and prevents and emotional meltdowns. My husband and I feel that putting her through this program was very beneficial for her and plan to put both of our other children through also. Lisa and Ross are a great support and work hard to individualize each program for each child. He has made huge gains in many areas. He is much more patient when he doesn’t understand things or demands made of him. He also has the mental endurance to complete tasks, math homework or assignment. He has also picked up reading novels for enjoyment and he fully understands what he is reading! Joe’s behaviour (i.e. bouncing) when doing a task at the table and his attitude (i.e. doing homework) changed significantly when he began having Ross as an instructor. I think Joe needed the male model of firmness and calmness so that the tasks were completed. Right now it is hard to say that his math or spelling improved but six months from now I will tell you. Occasionally I notice his keen memory of details and ability to understand the meaning of jokes. The amount of confidence, and his understanding of the fact that most people have areas of trouble, is amazing. The area he was most upset or concerned about was math and he has very little fear anymore. Trent is doing much more independent work. Trent never complained about PACE and I believe this is because he realized its benefit immediately. Lisa and Ross have amazing patience with both the kids and the parents. We would recommend this for any child with a problem that school just can’t deal with. Trent will miss Lisa very much but he may want to return if need be. We just wanted to say thank you for all your help. the two of you made our family feel very comfortable, you helped explain what our son was dealing with and made up understand how to support him. You truly have a great way with children and make them feel important. I would also like to share our story with others; I think it is important for us as parents to follow our instincts when it come to our children. I am glad I did. I have felt for a while my son was having some difficulties with reading and spelling. The teachers always assured me he was fine and to just keep practicing with him. Deep down I knew there was something more. I came to Accomplished Learning Centre because one day I was in my son’s Grade 2 class (as a parent helper) and the students had to write a story on their Favourite Place. The teacher took about 20 minutes to explain what they were to do and how they were to do it, and sent them back to their desks to begin. About 10 minutes into the half-hour time limit they had, I looked over at my son. His face was so red and his eyes filled with tears and when he saw me looking at him the tears started to flow. He started crying, I can’t do this! I don’t know what to do! Going over to him and seeing that the only thing written on his paper were his name and the date, I wanted to cry! I knew something was just not right. That day I called Accomplished Learning Centre. He was tested a couple of weeks later: his problem areas were Auditory Analysis, Logic and Reasoning, and Selective Attention. We began Samonas in the beginning of November. We started noticing little things within the first couple of weeks and it only got better as time went on. He actually wanted to read, it wasn’t a fight anymore. He will now try to sound out words. His spelling was improving, he had this new look in his eye, hey I can do this! Well, about 10 weeks later I was back in my son’s class helping out. That day the students had to write 4-5 sentences on their feelings about a story the teacher just read to them. I was scared to look and see how he was doing. When I did look over he called me over (I thought, oh no) but to my surprise he was already working on his fourth sentence and just wanted help spelling a word. I was so happy! We have completed the Samonas program and the changes we see in our son just amaze us, not only in his reading, writing and spelling but his self-esteem has improved his attitude has changed greatly. He has balance now as before he was very clumsy. He can actually stay focused on one this for longer than a minute. He has self-respect and is not afraid to try new things anymore. He has grown so much in these past weeks. Thank you Ross and Lisa. Your support and encouragement have made a world of difference in our son’s life. Don’s self-confidence has changed significantly. He will not only try things that he wouldn’t before, but he lets his personality shine through now. He seems a lot happier. He has improved on getting projects done in a shorter time and doing a much more focused job. We hope to see more improvement academically in the near future. Don really enjoyed coming to PACE and he will actually really miss his sessions. He had a lot of fun working his brain. I have seen some wonderful changes come about in Ann. Her understanding of math has greatly increased. When I explain something she understands pretty much right away. Her confidence has gone up tremendously. She sees that PACE has helped her greatly. She is doing much better in her spelling but her comprehension is what I am so happy about. When my daughter started PACE & Master the Code she had a really hard time studying. Being only in Grade 4 and spending whole afternoons studying, sometimes until 10 pm was just a huge hardship not only for her but for the whole family. Part of it was that she could not recall what she did that day at school or what her homework was. She was very forgetful and distractible by background noises. This was the first improvement I noticed with my daughter: that she remembered more, could recall instructions for school projects… I actually had to study with her, guide her step by step, for the tests and she would get C+ the most. With the help of PACE my daughter could get better marks which was a huge encouragement for her. With MTC her spelling and reading improved and so did reading comprehension. My daughter still has a long way to go but PACE & MTC had been such a help for her as nothing before. Thank you Lisa & Ross. Before PACE, Matthew struggled in school. He was not motivated to do any work. Getting him to start and finish tasks were a struggle. He would not do any homework and would get frustrated very easily if he was forced to do homework. He shut down at school many times, refusing to do any more work. We saw a change in Matthew a few weeks into PACE. He was starting to complete tasks at school. Although he still did not bring any school homework home he did his PACE homework with no frustration. He now is in Grade 8 and is doing all his work plus doing his homework without us even asking him to. He is motivated to get good grades and his self-esteem has gone way up. So far it seems to be the most effective way to address the situations that our child needed and is definitely worth spending time and money. It’s amazing how everything is skillfully achieved even though it is a very tough training. I can observe the following: faster in addition and multiplication; increased concentration as he can sit for longer periods of time; increased memory (remember stuff for longer periods); increased confidence. We have seen much improvement in Victoria over the 12 weeks of the program. In particular, her ability to stay on task when doing a project for school or otherwise. Reading and spelling improvements as well. Good marks in spelling and she reads chapter books almost every night. The confidence she receives as a result of doing well in all areas of study translates to a well-rounded nine-year-old girl. We feel that getting her “on track” was well worth the effort and expense. We entered the Samonas Auditory Intervention program as we saw a big slide in academics at the start of Grade 4. Sean was experiencing huge frustration at home and failures in class. Within two days of starting Samonas, all temper outbursts stopped completely. He developed insight into how he was feeling and was able to put the frustration into words and avert any outbursts. Our home is completely a happy place again. Sean’s relationship with his sisters is better. His social skills has increased + + +. Unfortunately we have seen little change in academics but we strongly feel that the results we have seen in behaviour was worth the time and month spent. One area that improved significantly is Andrew’s attitude toward homework. Prior to PACE, it would take an entire evening to do a 10-word spelling practice and a lot of time and energy was spent on resisting and avoiding homework. He now puts a lot more time and energy into doing his homework and he is accomplishing much more. Another main concern when entering the program was Andrew’s written work. He has a difficult time expressing and explaining his thoughts on paper. he will now put more time and effort into this but he still struggles. We are hopeful that with his improved attention span and work ethic, Andrew will be more receptive to extra help in this area. We believe that the major learning skills focused on in his PACE training will help eliminate the obstacles that were causing him to fall behind in school. We will now be focusing on helping him get caught up and we look forward to sharing Andrew’s progress with you. Amy no longer goes to school with a sore stomach or feeling sick. She is relaxed and happy in the mornings and no longer screams at or hits her friends. she has gone from not desiring to read and really stumbling over words to reading chapter books on her own (one cover to cover in one evening). Fluency and expression in reading is now very much improved. We feel as though we have our Amy back. She is even able to clean up after herself more effectively. Also, in writing, she is able to think of and write a sentence with little or no trouble now. Matt no longer gets into trouble at school. He hasn’t had any class problems or been to see the principal since school started. He colours a lot better and is more willing and able to tackle homework. His written work is much improved and he doesn’t make near the errors he did before starting the program. We are happy with it so far and can see a wonderful work in progress. Time will keep on making it better. I am convinced of that. Kim has gone from rarely completing work during class time to almost always completing work in class time. Instead of having 30 minutes to 1 hour of unfinished work to complete every night, now she happily shows us her work is done. She is enthusiastic about school now, taking initiative to study for tests and cares about the quality of assigned work she hands in. The best part is she is a happier kid because she has confidence in her abilities. We no longer have nightly homework fights, and our relationship has become better as well. Now that we understand that Kim was as frustrated as we were, we find we have more patience and compassion for her as well. We are very grateful and happy with our decision to have enrolled Kim in PACE! This program (PACE Processing And Cognitive Enhancement) was a true life saver for us. At the start of Grade 5 he was overwhelmed and very stressed out. He was not getting enough work done in class resulting in tremendous amounts of homework and was struggling very much with tests. We noticed improvement in the first few weeks and halfway through his teacher noticed huge improvement. He went from barely passing tests to getting A’s and B’s!! He is getting more work done during class time and barely any homework. His reading speed and comprehension is much better and he is overall more confident. Thank you! Improvements: Better concentration on tasks; processing information more quickly; not using fingers in operations; was assessed by her school in reading in June at Grade 5.4 level and re-assessed in September (after completing PACE over the summer) at Grade 6.5 level. Sean would never do puzzles and word searches and now he enjoys both. Spelling is more natural. Handwriting and printing are better. Reasoning (i.e. If you do your homework then you can play outside). Most of Sean’s improvements I have noticed in the last month. I look forward to his growth to come. I have seen a great improvement in not having to work three times as hard as everyone else in class. After three months she was bringing homework maybe one time a week instead of every night. By the end of her courses she can do most homework by herself instead of us having to sit with her for 2-3 hours and teach it all to her and fight to get it finished. Her reading has improved and spelling of everyday words is much better. When Tania first entered the doors of Accomplished Learning Centre she was not very receptive but plugged along. She was in grade 3 and did not do any of the grade level work that the rest of her class mates were doing. She had been labelled as severe learning disabilities. She will be the first person to tell you that she has only been able to accomplish what she has because of all the work she has done with Lisa. She started on PACE, Interactive Metronome and Fast ForWord. It has been 8 years of hard work but she is now able to read and is doing grade level work. She was on the B honor roll first semester this year and earned awards in art, choir, yearbook, band and a medal for music. She will be graduating next year and is making plans to attend university. The amount of catch up work sent home from school has decreased. Improved focus and improved understanding have drastically reduced the bad attitude and level of frustration when faced with work brought home from school. This can now be completed with minimal to no supervision. Increased awareness and interest in the written word, before actually getting Fiona to sit and read anything was a challenge, now at least the books and other written material are not rejected as “boring” before reading even starts. Far fewer arguments with grown ups, there is now a much higher chance of a concept or explanation being listened to before being dismissed out of hand. In general there is a level of patience that did not exist before and a whole new level of curiosity in totally new things and ideas. 1. Increased her self-esteem. 2. She has a more positive attitude to tackling difficult things. 3. We can see the success she has had in the specific PACE tasks but as yet have not seen it in her schoolwork because it is summer vacation. 4. The Set game became a favourite and she has introduced cousins and other friends to it! My daughter has completed PACE. The coach (Lisa) was excellent. My daughter felt such a sense of accomplishment when she was able to keep up with other students completing work in class. The incentives offered kept my daughter motivated. She gained confidence in her scholastic abilities, I believe directly related to the positive feedback and reassurance of the coach. Desire to interact with family – to be included in events, t.v. watching together, tag along to pickup brother. Kim is planning better, time management. Recognizes selfish behaviour more often. Due to better time management Kim is able to do things that interest her i.e. painting. There has been an increase in his self-esteem. Increase in his concentration level. The PACE program we enrolled Norm in was beneficial in his training and comprehension of the English language and critical thinking skills; Ross as an instructor was very good in dealing with Norm on his good and not so good days. (A BIG THANK YOU.) Norm, although going through some troubling situations near the end of the program, has managed to come through it all better for it. short-term we have seen gains in his cognitive skills and we are looking forward to future improvement due to PACE. Dear PACE: This note is to inform you that I am very pleased with the improvements Jon has made this past semester! He has shown improvements in attitude, perseverance and reading ability. He is a brand new student! Surprisingly caught doing his homework, “I need to to my homework today, Mom. It’s due on Friday and I can’t work on it tomorrow.” – Speaks up for himself, “I got 10 out of 10 on my spelling.” – Remember to give me (mom) the info sheets and permission slips from school, and consistently he hands them in. – Talks about his day at school without being plied. – Really good fun and sarcastic sense of humour. It is in deep gratitude that I write this letter not only to support your amazing work but to give you a tangible letter of how connecting with the Centre & the programs that you offer ~ has not only changed my sons life but has had a ripple affect for the rest of my family~ as you know if one struggles we all struggle. The changes made in my son is nothing short of remarkable~ we came to ALC with my heart in my hand & a desperation for help/support with my son who was at the time 9- he was being bullied at school , didn’t have an aid & in the low 10th percentile for reading of course up until now we didn’t realize the problem was that bad. No to low self esteem after being the most popular & well liked kid in class 3 years running & then grade 4 hit bulling/ no aids/ the school work gets harder & if you cant do well you don’t fit in….so they suggested Ritalin so he would conform & learn better. He was diagnosed with ADHD. Lost alone & scared for what this meant for my son & his future ~ tattered & run down we walked into ALC & met Ross~ to make a long story short he reassured us he & his wife could help my family. I say that because any parent who’s child is suffering understands that it affects the whole family. He was informative, reassuring, understanding & most of all knowledgeable…he is also a parent which helps. Then steps in Lisa~ what a miracle worker, a proactive powerhouse! She then walked me through the procedures of what would be the best programs for him, taught me how to support him the right way for him to read to me, the funding options I had at my disposal, website articles & mainly about executive functioning, where to take my son for testing & what tests to do & how to get the best from my child without a Band-Aid. The support was phenomenal. Here we are a year later, my son is off all his medications, we have had several grants so he can do his fast for word, and reading assistant programs which he has grown leaps & bounds. He was at a 1/2 reading level & now at a 3/4. Spelling, math reading all improved but most important his self esteem is back, he walks taller & proud, not so fearful, has made healthy new friends, he takes Chess, Basketball, Parkour, kempo & Japanese, all his choice. He now has his life back~ he realizes mistakes need to be made in order to learn & he now has some great tools to not only survive but thrive in school but in the world. That’s ALL do the ALC & we would have been lost without them. I would recommend to anyone with a child who is struggling or if they are gifted they will excel with ALC & the team of care that they have set up. I am even getting my 62 year old mother who has ADD to start brain training in September 2013 as its never too late to support your brain or your life. I have never known a time where I did not have to meet with teachers, form my own lesson plans, do extra work from home and constantly research what was going to help my children. My daughter has struggled since starting school. I had noticed that she would stare into space and get easily distracted in grade one. I expressed my observations with the grade one teacher thinking that she could provide some insight considering this was my first child. After 6 months into school year the teacher repeated back to me what I had told her regarding my daughter being easily distracted, struggling with written output and following multiple instructions at once. My reply was,” Yes, what can we do?” “What is your advice?” “What is your professional opinion?” Her reply was a simple “I think you should take parenting classes.” Although this could have been true because none of us are perfect parents, what the teacher was seeing was the behaviour that was associated to my daughter’s learning disabilities. My daughter was a good kid, but struggled and then expressed that struggling like all kids do; in behaviour. She continued on struggling by knowing that she was different. Sitting in class she didn’t quite ‘get it’. Other kids would be working and she was not sure what to do. I spoke to the school and expressed that I believe there is maybe a processing disorder because she can spell CAT verbally but has difficulty writing it down. When getting her to spell it out on paper, she would not remember what a C looks like. Unfortunately my daughter was not severe enough to be put on the list for a Pyscho- Ed assessment at school. She would have to wait. By grade 2 she had no self-esteem, no confidence and hated school. In grade 2!!!! Who hates school in grade two?! She called herself stupid and would back it up with the fact that everyone knew it too because she was the one being pulled from the classroom to do extra reading help. I had to do something! My kitchen already looked like a kindergarten class, with letters on the wall and pictures with words. No one would believe that there was a reason she was struggling. She was fine socially, but academically she was suffering and I just knew there was something and it was not just a behaviour issue! I got her tested privately with a psychologist and she was diagnosed with ADD and a Non-Verbal Learning disability. Her grade two and three teachers where great as they could see she would think differently and would alter things for her and ask her to explain it to them the way she might understand it. But she still knew she was different. She was still behind. Later in school came assistive learning, and Education Assistance help in the school. I am all for helping our children but I do not believe in doing the work for them. I researched and researched and kept thinking that there has to be some way to help my child. In grade 4 she was forced into assistive learning and having someone scribe for her. I kept saying if she talks into a laptop and it writes for her or if a teacher keeps scribing for her, how is she going to fill out a job resume later in life?? Again, the main concern was to just get through the curriculum. What was really frustrating for my daughter was the fact that she wanted to do her work on her own. There were times where she would be writing and the EA would come by and say I am going to scribble for you and take the pencil from her and start writing. She grew more frustrated and in that the teachers saw a child who was unwilling to accept help. “We need to train the brain”, I kept saying to the teachers. How will a child learn if we do not train the weak areas of the brain? I did understand that they were more concerned about focusing on the strengths than the weaknesses, but again, we still need to add in strengthening what the area of struggle is or these children are still going to suffer later in life. What happened to my daughter is she became a survivor, meaning; she knew how to hide things she didn’t know; she knew who to align herself with in the class to get the work done; and she knew how to keep the focus off of her. A good skill, however, in school this type of child will just get by and fall through the cracks and graduate with only being able to read at a grade two level. This may sound harsh, but in some cases (not all) a reality. In my research to find something that could help my daughter, I had heard about the book the “Brain that Changes Itself”. In there, it talked about a woman named Barbara and I thought that some of her challenges sounded the same as my daughters. This woman did cognitive exercises to overcome these challenges. “I knew it! was all that went through my brain. This book explained about the science of neuroplasticity. It also talked about the program, Fast ForWord. I was on a mission to find out where I could obtain this Fast ForWord for my daughter, and I did! She started Fast Forward in January of 2014. It was fun for about the first week and then she started the complaining. I would push and she would push back. She knew she had to do it but was, at times, not wanting to. There was every excuse tried. Even just pretending to do it and then searching the internet when I wasn’t looking. Then something happened. She admitted one day after doing the Fast ForWord for about 3 months that is has helped her more than the tutor I hired for her the year previous. She can see now that this is helping her. She has just recently started the Reading Assistance and has not complained. Amazing since she is now a teen of 13! She even will do her Fast ForWord and Reading Assistance on her own without me asking. This year the teacher told me she would be receiving an award. The award was a Progress/Achievement Award. This award goes to the child who has progressed the most academically in a school year. The teacher was amazed and proud of the work and progress that my daughter has made. My daughter, the one who would be mortified and freeze if any teacher would stand near her or ask her if she needed help because in her mind it would signify and let everyone know that she needed help because she was stupid. This girl now was asking for assistance and was asking if she could have extra math work because she wanted to practice to ‘get it’. Her assignments are completed on time and we do not have the homework battles we used to have. I had to keep this award that she was going to be receiving a secret and as I sat in the seat of the gymnasium beaming and waiting for her name to be called I couldn’t help but think of how proud I was and how much she deserved this and how if it wasn’t for Fast ForWord and cognitive exercises I am not sure if we would be this far quite yet. As they called her name I saw her look around and think, “Is there another June?” She was shocked and kept looking around as if there was a mistake as she walked up to the front of the gymnasium to accept her award in front of the whole school and parents. It wasn’t the ‘honour roll’ but to us it was. She is more dedicated in her school work now than ever and next year wants to get all A’s. Plus next year it has been decided that she does not need the extra EA help she was getting this year. She is more confident to ask for the help when she needs it (and has proven that she does not need it full time anymore). Because of Fast ForWord she can now do the work on her own. No one scribes for her, the laptop does not talk to her nor her to it. She is proud because she is finally able and has proven that she can do the work on her own which has always been what she has wanted to do. She can now own that confidence! I would call this a success story, but it is a story that will continue to be successful because it is not over and it is just continuing to proceed and get better, thanks to Fast ForWord.